Chocolate brown is already such a dramatic color, but paired with various shades of cream it becomes even more luxurious and stunning. This board was inspired by a table Emily over at Once Wed posted about- Joy's centerpiece was absolutely breathtaking! 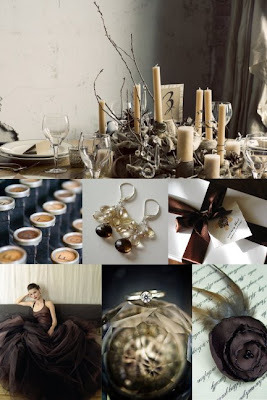 I loved how she incorporated everything from candles and branches, to linen and crystals. This wedding would be perfect for the hopelessly romantic couple wanting to evoke a lot of glamour and romance to their party, esp if it was held in a place like this.